Detective Manfred (Chinese megastar Leon Lai, looking decidedly worse for wear) is down on his luck. His wife was recently killed by a pickpocket, he’s living out of his minivan and his desire to find the perpetrator is becoming an obsession. Noticing his increasingly slipshod appearance and penchant for taking out his rage on an assortment of lowlifes and criminals, Internal Affairs (would any Hong Kong cop drama be complete without an appearance from Internal Affairs?) start sniffing around. While investigating the murder of a prostitute Manfred’s path also crosses that of the slick careerist Inspector Kee (Richie Ren), who initially appears to have a stabilising effect on the grieving detective. Kee’s motives are eventually revealed to be decidedly murky, however, and as the body count piles up the boundary between good and evil becomes increasingly blurred, leading to a denouement that’s heavy on gunfights, corruption, burning buildings and revenge killings. And explosions. Quite a few of them. 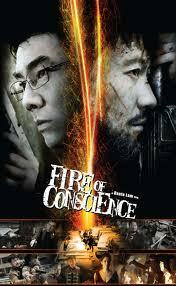 Director Dante Lam’s action chops certainly can’t be faulted. As was the case with his last feature Beast Stalker the action choreography is faultless, and the infrequent gun battles amongst some of the most memorable ever captured on film. The plot never really settles seamlessly alongside the violence however, and though Lam makes a valiant attempt at exploring his character’s back stories and underlying motivations the viewer never really connects with any of the protagonists in a way that could be called meaningful. The film, which has thus far received mixed reviews and a paltry box office gross, could perhaps most aptly be described as a disappointment. All the ingredients are certainly there – strong cast; interesting and expansive, if slightly predictable, plotline; experienced director – but somehow Fire of Conscience still falls a little flat. Visually arresting, it ultimately fails to really excite, and one can’t help coming away with the impression that it’s all been done before.